A British diplomat is to be allowed to visit the site of a huge explosion in North Korea that raised fears of a nuclear test, a British minister says. The UK's Foreign Office minister Bill Rammell requested acccess to the site during a visit to North Korea. 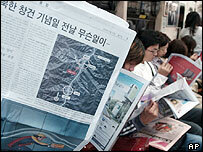 Pyongyang said the explosion was in fact the demolition of a mountain as part of a huge hydro-electric project. In an unusual concession, North Korea said Britain's ambassador could visit the site to see for himself. Mr Rammell, who earlier held talks with the country's foreign minister, Paek Nam-sun, welcomed the offer. "Having asked the vice foreign minister this morning for our ambassador and other ambassadors to be allowed to visit the scene of the explosion I am very pleased the North Koreans have agreed to the request," Mr Rammell said. He added that the ambassador, David Slinn, could visit the site as early as Tuesday. The United States and South Korea had already played down suggestions that the explosion, near Yongjo-ri in Yanggang Province, was caused by a nuclear device. "There was no indication that was a nuclear event of any kind. Exactly what it was, we're not sure," US Secretary of State Colin Powell told ABC television on Sunday. The blast is said to have happened on Thursday as the Stalinist state celebrated its National Day. It created what officials in Seoul said was a huge, and peculiarly-shaped, cloud. The incident and the fears it has provoked around the world are another illustration of the enormous tension between the regime and the international community, says the BBC's diplomatic correspondent James Robbins, in Pyongyang. North Korea is under international pressure to end all nuclear programmes and disarm. But so far it has offered only limited concessions during "six-party" international talks involving both Koreas, the US, China, Russia and Japan. It has not yet committed to attend a fourth round of the talks, which the Chinese, as hosts, wanted to start before the end of this month. "Opening up this country through dialogue is going to be very hard indeed"